Customers can also purchase chassis, integrating theISA board to the machine all at once. Posted on March 28, 2018 Categories UncategorizedTags 3.5 embedded board, car computer, car computer system, car computing, COM Express module, embedded board, embedded boards, embedded computer, embedded itx motherboard, embedded linux, embedded linux sbc, embedded motherboard, Embedded PC, Embedded SBC, Embedded System, embedded system boards, Embedded Systems, embedded systems companies, fanless pc, fanless pc i7, Industrial Computer, industrial computer manufacturers, industrial computing, Industrial Embedded mini pc, industrial embedded motherboard, industrial embedded motherboards, industrial motherboard, industrial motherboards, industrial pc manufacturers, intel atom motherboard, Mini-itx, network hardware, Networking, rugged industrial pc, singal board pc, single board computer manufacturer, vehicle mount computer, windows embedded, x86 single board computer, 單板電腦, 嵌入式工業電腦, 嵌入式電腦, 工業電腦, 無風扇系統, 無風扇系統電腦, 無風扇電腦Leave a comment on Customers can also purchase chassis, integrating theISA board to the machine all at once. server comes with the latest Intel® server chipset C236 PCH, which supports the latest Intel® Xeon® E3-1200 V5 server processor, and the 6th generation CPU Skylake-S Core i7/i5/i3/Pentium series. Moreover, the ANR-C236N1 designed for Skylake-S is forward compatible with Intel® 7th generation CPUKabylake. 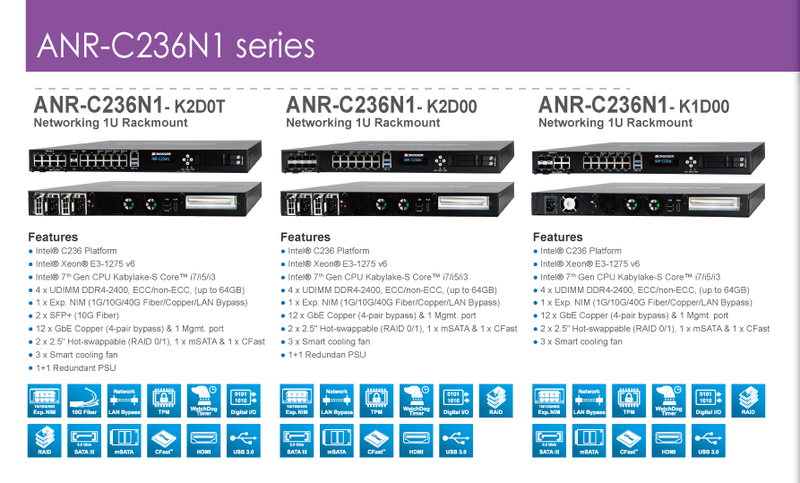 In addition, the ANR-C236N1 series provides a more flexible server platform & system expansion versatility with 12x GbE copper LANs (4-pair bypass), 2x 10G fiber networks (SFP+) , 1 x expandable network interface modules (Exp. NIM), 1 Console, 2x USB 3.0, 2 x USB 2.0, 1x HDMI and 1 x Exp. PCIe slot. Furthermore, ANR-C236N1 series is equipped with an LCM display which shows 100 x 16 Pixels in Graphic Mode and 16-character x 2-line in Character Mode. In the power system, a set of 1+1 redundant power supply units (RPSU) come with AC-IN (100~ 240V) , enabling reliable options for system recovery. The ANR-C236N1 power system comes with a special Smart Fan System which increases or decreases fan speed to develop efficient and cost-effective power systems.Acrosser had committed its valuable resources to further develop its advanced network product lines. Because of these efforts, the ANR-C236N1 had developed as a perfect service/network machine for most business networking applications. 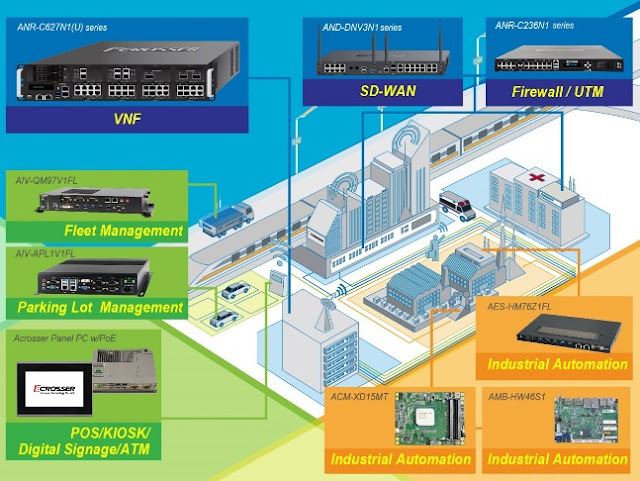 Acrosser Technology not only provides products with high reliability and availability, but also networking appliances and products with the best scalability and manageability in the industry. Acrosser Technology is your best choice for building servers and workstations in today’s workplace.